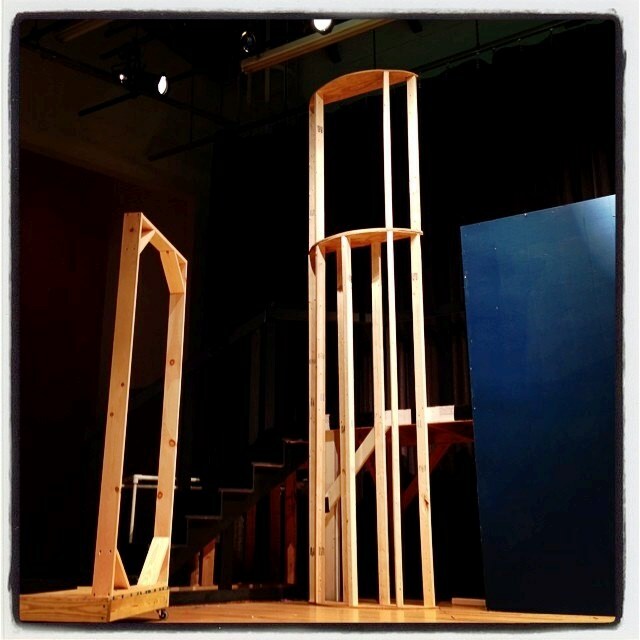 Posted July 23, 2014 by NBYT	"Making of..."
An early set design for Into the Woods Jr. The set for Into the Woods Jr has some specific requirements. The musical begins in three homes: one where Cinderella lives with her father and stepfamily; one for Jack and his mother; and one where the Baker and his Wife live and work. The musical also needs a tower. And woods. Lots of woods. Just like any theater, we at NBYT like our sets to reflect the world and the style of the play. Last year, for example, the set for Once on This Island Jr. was based on art naïf, a folk art of the Caribbean. 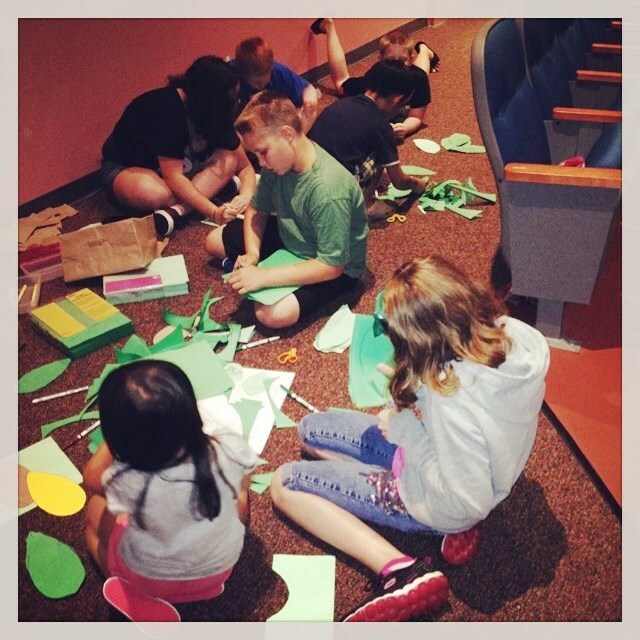 In our summer musicals, we also like the children to help make some parts of the set. 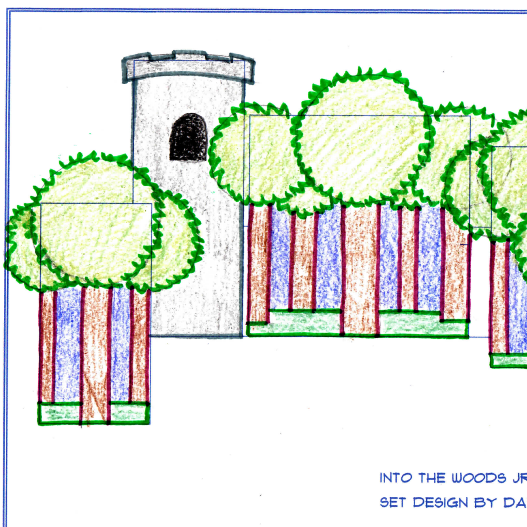 For Into the Woods Jr, a world populated by a few royals but mostly by peasants (like Jack and his Mother) and working folk (like the Baker and his Wife), we choose a folk art style again. Rapunzel’s Tower is the highest structure ever on an NBYT stage. Folk art is art of the people, art created not for palaces or royal halls, and not by commissioned or trained artists, but by everyday people. Folk art is often characterized by colorful patterns, bold lines, childlike qualities, and not always true-life perspective. Patchwork patterns often come up in folk art too. Cast members cutting leaves and bark for the set. For Into the Woods Jr, we decided to make our tree leaves out of a variety of patterns of recycled fabrics and paper (graciously donated by some cast members). The cast cut out well over five hundred of these leaves! For the tree bark, we cut strips of brown paper—using recycled bags and paper. They’re all pasted on to the set—again with the help of cast members and parents—and help to create the folk art look of the set. We think it also looks like a children’s story book! The folksy, woodsy colors of many of the costumes help to create the world of Into the Woods Jr too. Into the Woods Jr. will be performed on Friday, July 25, at 10:00 a.m. and 7:00 p.m.; Saturday, July 26, at 7:00 p.m.; and Sunday, July 27, at 2 p.m. in the air conditioned auditorium of Raymond Hill School at Klingberg Family Centers in New Britain. Ticket prices are $13 for adults and $11 for children, students, and seniors. Special group rates are available for parties of ten or more. Tickets may be reserved by calling New Britain Youth Theater at 860-515-8115 or may be purchased online at Brown Paper Tickets.